Transit and occultation photometry have given us a lot of insight into exoplanet atmospheres by allowing us to identify atmospheric absorbing species (like potassium or sodium), Rayleigh scattering (which makes our own sky blue), and clouds and hazes. The tiny signals are difficult to make out, because they easily become washed out by the scatter in the measured photometry. But astronomers have pushed the noise floors further and further down, to the point where a number of higher-order science signals have begun to surface. In a small handful of cases, there have been detections of phase curves that exhibit off-center bumps which indicate off-center hotspots on the planet due to winds, “ellipsoidal” variations due to the rotation of oblate host stars, and phase curves that reveal the changing amount of stellar light reflected towards us as a planet traces out its orbit. Additional effects have been theoretically studied in preparation for super-precise observations with the next generation of facilities, like JWST. These include a relativistic “Doppler beaming” effect whereby emitted light is beamed in the direction of the planet’s motion, and the refraction of host star light through the exoplanet’s atmosphere. Today’s paper considers another effect called “forward scattering”. Something interesting happens if you backlight spherical particles with light that has a wavelength comparable to the particle size. If you solve Maxwell’s equations (which describe the underlying behavior of light and electrical charges) inside and outside the spheres and apply appropriate boundary conditions, it turns out that the particles preferentially scatter incident light in the original direction of the light beam. This mathematical treatment—treating particles as tiny billiard balls with certain indices of refraction—is known as Mie theory, and is surprisingly successful at describing the interaction of light with aerosols. In fact, it explains why clouds are white! The authors of today’s paper took inspiration from the strong forward scattering observed through the thick and hazy atmosphere of the Saturnian moon Titan. Titan’s forward scattering is so strong that its brightness can be a couple hundred times as much as its fully illuminated face! 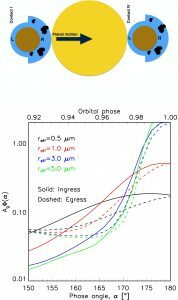 The authors wondered, how large is the effect of forward scattering through exoplanet atmospheres, and if we can detect it, what would it tell us? First we need to define the “phase angle”. This is the star-exoplanet-observer angle (Fig. 1). Call it α. For an edge-on system, the limiting case of a phase angle of 0 degrees means the exoplanet is behind the host star, and a phase angle of 180 degrees means the planet is exactly between us and the host star. where the Ag is the geometric albedo, Rp is the planet radius, and a is the orbit semi-major axis. The forward scattering is packed into the Φ(α). The Φ(α) term is proportional to the aerosol scale height over the planet radius, Ha/Rp. 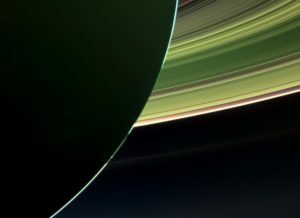 This is “a measure of how puffy the atmosphere is” and determines the thickness of the atmospheric “ring” around Saturn you can partly see in Fig. 1. The authors scoured exoplanet databases for planets with data that would allow us to fill in each piece of the equation above. They find that there are indeed some already-known planets that could potentially have forward scattering at the level of ~10 parts per million (ppm). This signal is tiny, but may be detectable by JWST. The bottom line is, planets with aerosol atmospheres with grain sizes on the order of visible wavelengths will tend to have more forward scattering the more extended the atmosphere is. This means that puffy planets in tight orbits may be particularly good candidates to search for these signals. Forward scattering may have been glimpsed in the case of the disintegrating planet KIC 12557548 b and it will be particularly important to consider it in future observations for a number of reasons. Even if we cannot identify atmospheric aerosols through their absorption lines, we can put constraints on them by mapping out the forward scattering strength as a function of phase angle. And if we can do that, we can put more constraints on the larger atmospheric chemistry and energy budget. In addition, since forward scattering causes us to see more light from the star as the planet passes in front of it, if we’re not careful we could get the wrong impression that the atmosphere is thinner than it actually is. 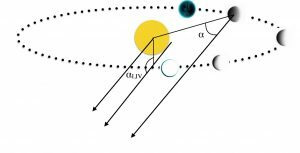 Forward scattering could also serve as an exoplanet detection method, even for non-transiting planets! Intriguingly, the authors suggest that higher-order photometric effects like forward scattering may help resolve stubborn systematic disagreements between exoplanet masses as determined by transit photometry and radial velocity studies. Maybe we’re seeing these effects, but our inability to identify them in the noise has led us astray. With that in mind, let’s get back on track and add forward scattering to our battery of tools for tackling the mysteries of exoplanet atmospheres.